In her most recent Cairo exhibition, which closed on 4 February, Cairo-based Syrian artist Souad Mardam Bey continued to present a different vision and philosophy through her paintings at Zamalek Art Gallery, a location that embraces most of her creative works in a city where she has built a name for herself on the artistic scene. Mardam Bey continues to display her signature style as shown in previous exhibitions such as Adam (2018), The Magic Thread (2016), and a 2013 display where she focused on the Arab Spring. This latest exhibition is titled "Veni, Vidi, Amavi," which translates to "I came, I saw, I loved," a play on Julius Caesar's famous Latin phrase “Veni … Vidi … Vici,” which translates to "I came, I saw, I conquered." However, Mardam Bey's artistic vision is quite different from that of the Roman conqueror, conveying a message of passion rather than glorifying war. 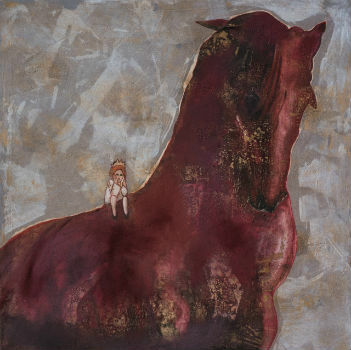 The exhibition's theme is “travelling,” whether riding a horse, a bull, a train or travelling through the imagination. Understanding the messages of love as mentioned in the title, and the theme of travel embedded in the paintings, requires a lot of mental effort, after which the viewer may see them in a light other than the artist intended, and come out with a completely different interpretation of the paintings, which makes them more intriguing. Mardam Bey seems to enjoy taking on large canvases; the centrepiece is a two-square-metre painting of a black train with somber details. The theme is travel, but the painting expresses sadness and danger, expressing the dark side of travelling. 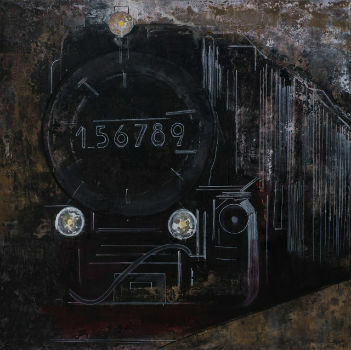 The numbers on the front of the train have no specific significance, but they show the artist’s attention to detail, which indicates that the loose lines found in the other paintings are intentional. 'Travelling feeds the imagination' is the motto the artist chose for her paintings. This imagination is expressed quite well in the image of a young girl crowned like a princess while on a horse’s back. She seems comfortable and deep in thought while the horse is accommodating in a submissive, neutral position. The sizes are totally un-proportional: the girl is very small and clearly detailed, while the horse is quite large with just enough detail to distinguish the pride in the animal’s face. The same can be said about the girl sitting on a bull’s horn with flowers in her hands as the bull jumps skyward, yet the small girl seems comfortable and composed. She is travelling on the bull’s horn in her dream world. Another girl holding onto the bull’s tail and flying into a fun journey is another fourth or fifth dimension of imagination; a situation that can never happen in reality yet appears appropriate for the painting. The dream world also manifests itself in the image of a regal lady sitting by a window with trees and animals in the background. 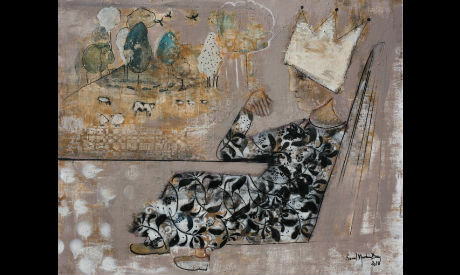 Mardam Bey’s paintings almost always show her characters with crowns on their heads, if we want to read into that special detail, the artist sees everyone she paints as royalty and deserving of a crown -- human life is worthy in Souad’s world. Most of the characters in the paintings have sad eyes and neutral faces, in other words, not happy or joyful. When we combine this fact with the pale colours the artist used in most of the paintings, we get a sad tone from the exhibition as a whole. The art conveys how travelling nowadays can be a sad, hectic experience. Between irregular migration, the tiresome process of embarking on a trip, and financial constraints, travelling in real life can be difficult. These ideas are in the back modern man's mind, the artist included. The artist says that the voyage, not the voyager, is the protagonist in her exhibition, but viewers may disagree. Many of the paintings are set in a dream world, which begs the question: whose?